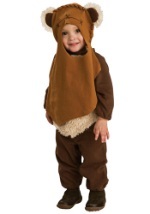 Dress up your little one this Halloween in this Ewok costume for a look that is sure to get everyone's attention. The dark brown polyester romper Velcros in the back and inner thighs for easy on and off. The torso features a soft, faux fur patch in tan and the light brown headpiece has a hole for the face and two attached ears. The headpiece hangs down to the belly of your little one for added detail. The perfect Star Wars costume for your baby!